U.S. Navy Adm. Bill Moran, vice chief of naval operations, has been nominated to serve as CNO by President Trump. “I’m honored and deeply humbled by the nomination and look forward to working with Congress during the confirmation process," Moran said in a statement released Thursday. David Bernhardt, acting secretary of the Department of the Interior, has been confirmed by Congress to serve in the role on a permanent basis, The Hill reported Thursday. Congress voted 56-41 confirming Berhardt, who will manage energy production efforts offshore and in publicly owned U.S. land that spans around 500 million acres. President Trump nominated Air Force Gen. John Hyten, commander of U.S. Strategic Command, to serve as vice chairman of the Joint Chiefs of Staff. Acting Defense Secretary and 2019 Wash100 Award winner Patrick Shanahan announced Hyten’s nomination in a news release published Tuesday. 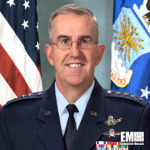 Hyten started his military career in 1981 and held several leadership roles with the Air Force, including head of Air Force Space Command, director of space acquisition and cyber and space operations and requirements chief at Headquarters Air Force Space Command. President Trump plans to nominate Jovita Carranza, treasurer at the Department of the Treasury, to become administrator of the Small Business Administration, Reuters reported Friday. A bipartisan group of 99 House lawmakers agreed to increase the U.S. military’s fleet of F-35 fighter aircraft to reduce maintenance cost and address growing threats of other countries’ missile systems and stealth fighters, Defense News reported Monday. The Joint Strike Fighter Caucus sent a letter to House leaders calling for 12 additional F-35As and 12 F-35Bs for President Trump’s 2020 budget request. President Trump nominated Lt. Gen. David Berger for the U.S. Marine Corps commandant position. The nomination also includes Berger’s potential promotion to general. Berger serves as USMC's deputy commandant for combat development and integration and commanding general of the service branch's Combat Development Command, the Department of Defense said Wednesday.